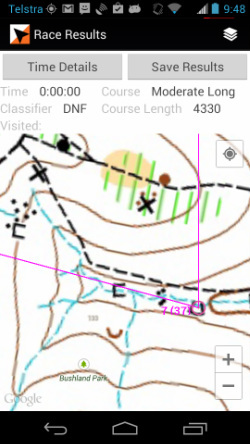 When you run in a event from the main screen, MyOMaps records your event time both in total and for each leg of the event. The Race Results screen that displays upon completion of a course is shown here. It shows the GPS track overlaid on the map and course. - Classification of the result: OK; MP (mispunch); DNF (did not finish). - Number of controls visited (which includes the Start and Finish). The Time Details button goes to a screen showing the splits - ie the time take for each individual leg. o If there is an Internet connection to the MyOMaps server. On the MyOMaps server, the results are automatically merged with other results for that same course to create a combined OE Results file for loading to Winzip or Splitsbrowser etc.